Watch police officer caught singing Shake It Off on camera! This is hilarious police officer was caught on camera singing Shake It Off! Someone has clearly been practising those moves! 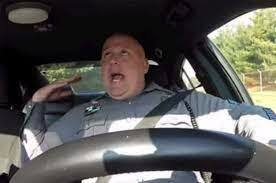 Watch the video below to see American police officer Jeff Davis sing his heart out! He was caught filming for a new series the police department are calling ‘DashCam Confessionals’! Click here to watch the real Shake It Off music video! Taylor herself responded saying “LOLOLOL the sass!” She loved it! The video has had over 12 million views! Watch out Taylor!